José Reyes at work in his studio. Do you know the story of how José’s baskets became known as Friendship Baskets? Paul Whitten writes in his book Nantucket Baskets; “ A number of years ago a Nantucket woman carrying her Reyes handbag while in Paris noticed a woman across the street carrying one as well and yelled out “Nantucket!” The lady across the street was understandably startled, and stopped to speak with the woman. 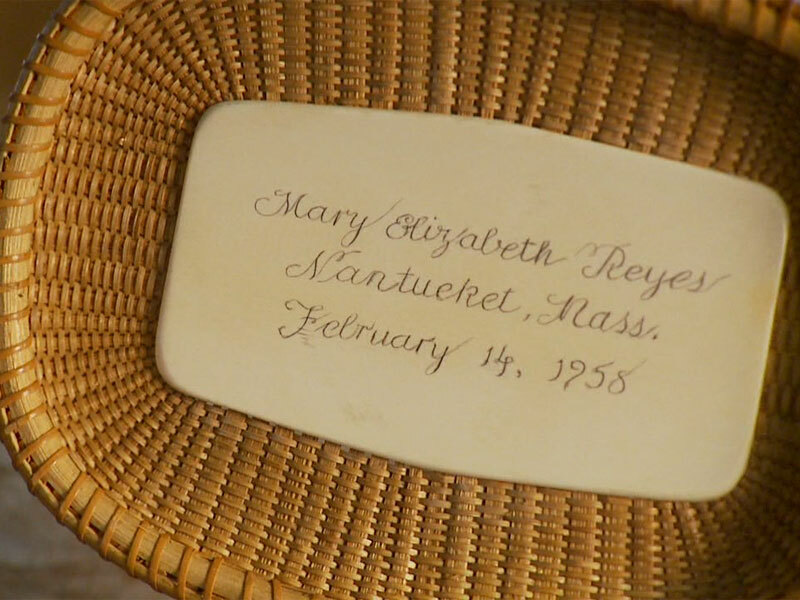 That chance encounter resulted in a friendship that endures to this day.” There are many similar stories such as a woman meeting her husband on a transatlantic crossing, because he recognized the basket being of Nantucket and struck up a conversation. José was born in Santa Maria, Ilocos Sur, Philippines on September 15th, 1902. After schooling in Santa Maria, Jose came to the US and graduated from high school in Portland, Oregon he then received a BA from Reed College. He also received a scholarship to Harvard University and graduated with an M.Ed. 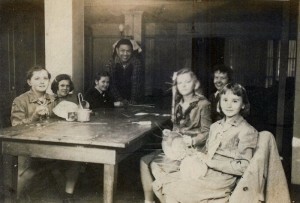 José Reyes teaches a class with young basket makers. Following his marriage to Mary E. Ham of Massachusetts he returned to the Philippines. In 1935 he joined the staff of the Philippine Military Academy becoming head of the Department of Languages and Social Arts. In December of 1941 José joined the US Army. After the Philippines liberation in 1945, José returned to the US with his family. He was discharged from the Army with a rank of Captain and automatically received his American Citizenship in 1947. That summer, José’s’ mother in law invited the family to rest and recuperate at her Nantucket property. Like many others who have vacationed on the Island, José and his family knew they had found their new home and never left. Unable to find a teaching position, José first worked as a house painter and repaired cane and rush chars. 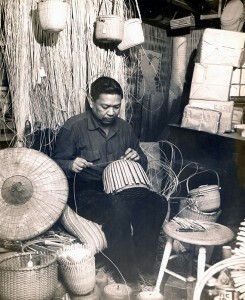 A picture in Life magazine of a basket with a cloth top gave him the idea to apply his weaving training learned in the Philippines to a possible money making venture on Nantucket. It was at that time he was befriended by Mitchell Ray, who showed him the craft of weaving a Nantucket Lightship Basket. With Mitchy’s encouragement and a few of Mitchy’s molds that he had inherited from his father, José’s new career was launched. In the summer of 1948, José developed the “friendship basket” pocketbook. Another local craftsman, Charlie Sayle and his wife suggested the ornamentation of his basket tops with an ivory whale or seagull. José became well known for his innovative style and unique designs in basket weaving. From that time until his retirement in 1978, it has been estimated that he made over 5,000 baskets. José died at his home on Nantucket, December 24th, 1980.